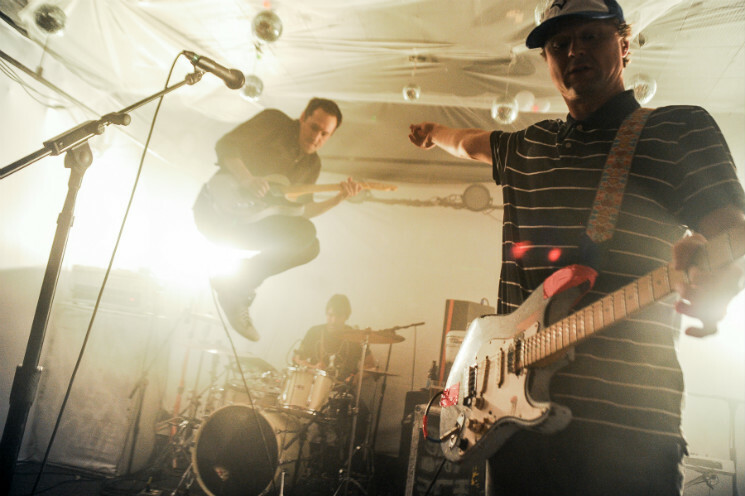 Whether the intimacy of the venue or the camaraderie between bands was the cause, Hollerado's Friday (October 20) show at the Horseshoe Tavern felt less like a concert and more like a collective healing session after a rough week of loss for music lovers. Hollerado and Royal Mountain Record labelmates Little Junior are no strangers to Toronto, but the show would mark the first time that the third band on the bill, Calpurnia, ever played the city. Finn Wolfhard, the Vancouver actor best known for his lead role in Stranger Things, has been something of a Royal Mountain honorary member since appearing in PUP's "Guilt Trip" music video a few years ago. Now, he's just about fully initiated as the frontman of Calpurnia, leading a pack of musicians of about the same age. Wolfhard kicked things off by announcing "This is our favourite song, it's called 'Wonderwall'," before actually playing a tune by the Chicago indie band Twin Peaks, proving from the start that their influences range far beyond what might be expected of young teens. The set consisted of roughly 50 percent covers and 50 percent originals, with the band taking sonic cue from late '80s, early '90s noise pop and alt-rock. Wolfhard's raspy, Black Francis-style vocals were an obvious standout, as were Ayla Tesler-Mabe's surfy guitar licks. A cover of Mac DeMarco's "My Kind of Woman" showed the band wear their influences earnestly on their sleeves, and time signature shifting originals showcased the band's unity despite only having played less than a handful of shows to date. Calpurnia are clearly on Hollerado's radar, and they ought to be on yours, too. Little Junior are yet to have a formal release in the wild, giving them the difficult task of getting a crowd of mostly unfamiliar listeners to engage. Fortunately, it was hardly a challenge thanks to the group's obvious onstage electricity and snarky banter. Between dedicating tracks to Ryan Gosling and playing two songs "for the haters," the band went all in on the snotty, brat-pop sound of early 2000s teen movies, to huge success. As if to affirm their comfort in existing in that world, the group ended their set with a cover of Wheatus's all-too-melodramatic "Teenage Dirtbag," with Calpurnia's guitarist joining them onstage. By the time Hollerado emerged, the Horseshoe was filled to the brim with friends and fans. With over 100 songs across four releases under their belts, the band have enough of a catalogue — and enough experience playing it — that they can mesh together bits from multiple songs alchemically into these brilliant half-jam, half-medley creations. From "Juliette" to "Eloise," Hollerado has developed a mini-arsenal of sing-along hooks, and took full advantage of the massive and compliant crowd to make each one sound as big as possible. Following guitarist Nick Boyd's vocal bridge on "So It Goes," frontman Menno Versteeg initiated a sea of peace signs, echoing the band's latest album cover, that persisted until the end of the song's last blowout chorus and wrapping their initial set. Returning for an encore, the band did what just about everyone in the room was expecting — and hoping — for them to do. "It's been a tough couple of weeks," Versteeg admitted. "So we want to celebrate some of our favourites, that cool with you guys?" Leading with a tribute to the late Tom Petty, the quartet put everything they had into a loud and guitar-heavy rendition of "Free Fallin'." After that, they played tribute to a fellow Canadian. Seeing how videos of the Tragically Hip had been playing at the front of the Horseshoe when attendees entered earlier, and with the news being so fresh, it felt like everyone in the room wanted to sing a song for Gord. Equal parts cathartic and inspiring, the band shared vocal duties on a cover of "Wheat Kings," closing the show and ending the day with Gord's poignant line, "Let's just see what tomorrow brings."